Generics is a technique whereby functions and classes can be written in terms of types that are not specified when there are written, then later used for many different types. For example, You can write a single sort method that could sort the elements in an Integer array, String array , or any type of array that supports sorting. 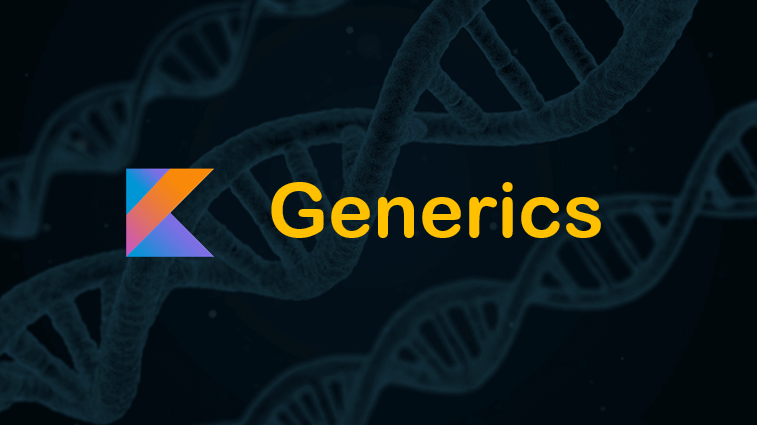 Generics provide a way for you to re-use the same code with different inputs, parametric polymorphism and templates are names used in other languages. Type-safety : We can hold only a single type of objects in generics. It doesn’t allow to store other objects. You can declare a function or class with generics, classes in kotlin may have type parameters, sometimes referred to as container because of close association with collections . To declare a parameterized type, we use the angle bracket syntax on the right-hand side of the type name and put the type parameters in the angle brackets. You can use the type parameters in the body of the class, just like any other types. We can declare more than one type parameter. The most commonly used parameterized types are collections. We can declare a typed parameter with the primary constructor. To create an instance of such class, we need to provide	th type arguments, we must "fill in"? that type when we instantiate it by replacing the parameters with concrete or proper types. The parameters may be inferred and thus type arguments can be omitted, 10 has type Int, so the compiler knows that, and we can remove the type. Functions can also have type parameters; type parameters are placed before the name of the function. In above example, we have defined a single type parameter-T-which we then use for all three parameters and the return type. We are informing the compiler that whatever type we fix T to be, we will return that same type. This allows the compiler to correctly infer the return type. Functions can have more than one type of parameter. You can apply the generics on top-level function and extension functions as well. Generics on the JVM are normally implemented through type erasure, the type of arguments of an instance of a generic class are not preserved at run time. Type arguments are erased at runtime, as a workaround, type parameters of inline functions can be marked as reified. Generic constraints restrict the set of all possible types that can be substituted for a given type parameter. The most common type of constraint is an upper bound that corresponds to Java's extends keyword. This will restrict the types to those that are subclasses of the bound. To use an upper bound, simply declare it alongside the type parameter. The type specified after a colon is the upper bound, In the above example, only a subtype of Comparable may be substituted for T. Comparable is the standard library type that defines the compareTo method, used for comparison. In the above example, we defined our type parameter with the upper bound of Comparable, any time this function is called, the value of T must extend from this type. In below example, T must be subclass of Number class. The default upper bound is Any? Only one Upper bound can be specified inside he angle brackets. Sometimes, you might want to have more than one upper bound, we need a separate where-clause., we move the upper bound declaration out of the type parameter. In below, example we would be accepting a value which is sub class of CharSequence and Appendable, I hope you know the difference between String & String Builder. Classes also can define multiple upper bounds, the syntax is similar, with the where clause written after the type parameter. Type variance describe how types with the same base type and different type arguments relate to each other. If we consider a class Benz, which is a subtype of Car, then is a Crate<Benz> a subtype of a Crate? The first instinct is to think 'of course', since an Apple can be used where a Fruit is required, but generally speaking the answer is no. In fact, a Crate<Benz> can be a subtype of Crate<Car>, a supertype of it, or neither depending on which type of variance is used. Don't hurry with Inheritance to derive conclusion when you are using the classes in Generics. Understanding the variance is important when you write your own/custom generic classes or function in kotlin. It helps you create APIs that don't restrict users in inconvenient ways and don't break their type-safety expectations. So Speed<Benz> might not be a subtype of Speed<Car>. In kotlin, type parameters are invariant by default, which mean there is no subtype relationship between the types. Type M<T> is neither a subtype or a supertype of M<U>, regardless of the relationship between T and U. So to compiler a Speed<Benz> and a Speed<Car> are as related as a Speed<Benz> and Speed<Duck>. A generic class is called covariant, if any two types A and B, SomeClass<A> is a subtype of SomeClass<B> if A is subtype of B. To declare the class to be covariant on a certain type parameter you put the out keyword before the name of the type parameter. Marking a type parameter of a class as co-variant makes it possible to pass values of that class as function parameters and return values when the type arguments do not exactly match the ones in the function definition. You cannot make any class covariant, it would be unsafe. Constraints the possible user of this type parameter in the class. To guarantee type safety, it can be used only in out positions, the class can give out values of type T but not make them in. For example, a class that declares a type parameter T and contains a functions that uses T., if the T is used as return type of a function, it is in out position, the function produces values of Type T.
Contra-VarianceContra-Variance is opposite of covariant, the relationship between the type parameters is reversed in the types themselves. String is subtype of Any, Box- would be a supertype of a Box if Box had its type parameter marked as contra-variant. To mark a type parameter as contra-variant, we mark the type parameter with the keyword in. Above example, a class that declares a type parameter T and contains a function that uses T, if T is used as the type of a function parameter, it's in in position, The function consumes the values of the T.
The function interface is declared as contra-variant on its first type parameter and co-variant on its second, which makes (Animal)->Int a subtype of (cat)->Number. When using type parameters, there is a distinction between use site and declaration site variance. Use site variance is the term used when the variance of type parameters is set by the variable itself. Declaration site variance is the term used when the type or function determines the variance. It is very convenient to declare a type parameter T as out and avoid trouble with sub-typing on the use site. The above class cannot be either covariant or contra-variant in T, imposes certain inflexibilities. The above function supposed to copy one array elements to other elements. We want to make sure that copy() doesnot writing to from. We said that from is not simply an array, but restricted(projected) one.